Yesterday, I didn't have any particular reason or worry for feeling restless, but I did. (Well I have lots of worries and reasons, but not any one of them so large yesterday.) So what was my solution? Keeping busy. First, I made chocolate chip cookies - yum. Then I sewed a bit more for my 3rd attempt of this pattern. I'll show you when it's completed. I did laundry (of course), visited the garden and spotted a rabbit thief! I edited a tiny bit more of my book (will it ever be finished? ), cleaned the frog tank and got to punch something! Punching French baguette dough, that is. I pulled out the recipe that I've made since we were first married, and found that I didn't have enough of all-purpose flour, so I threw in some white whole wheat flour. I think I may use that more often. It was very yummy. Did my restless feelings dissolve? Not necessarily. But they did subside a bit and produced some good results for the day. Now if only my busyness would include more decluttering and organizing...but hey, who wants to do that? I recently purchased this new book. I love it. It involves all sorts of printing methods that you can do at home; most I've read about and/or done before at various stages of my life. It's a nice reminder and refresher book. There are stencils and patterns included, and the book stays flat because of the spiral binding. Now for the Free Book... Simple Mom is giving away one of Amanda Soule's The Creative Family books. She's also posted an interview with Amanda. Hurry over and see! Winner! & Final Dress-Up Giveaway! Winner of D-U-G-A #3 is perilloparodies! Just email me your info, and I'll send off your goodies. Now for the 4th and final giveaway: A Dress-Up Giveaway with goodies to make something. There is a twist... make something with some (or all) of the items that you receive for your child or for child you know. Surprise them with an imaginative dress-up gift. A cape? A bag? A skirt? A belt? I won't put a time limit on this because I know how busy we all are. Then when you've completed your dress-up outfit or accessory, post a picture on your blog for all to see. I'll make a Dress-Up List on my sidebar to let others know what you're up to. That's it! Leave a comment. I'll pick randomly from them and post the winner's name next Monday. Enjoy! And thanks for all who've participated. For giveaway... scroll down. A few days left. Trying to spray the extra dye from the t-shirts. Rinsing some t-shirts in buckets of water while other shirts wait their turn. Liking some of the designs while wet. Watering the grass with colored water. Modeling some of the finished products. Notes: Next time, we'll tie-dye the old-fashioned way without making tight bundles. The dye really needs to get into more of the crevices otherwise you end up with lots of white left over. I think we're going to re-do a few of them (with our leftover dye) to add more oomph. We're enjoying some summer family time together: tie-dyeing t-shirts. Wringing out the rubber-banded bundles. Mixing the different colors together. Yeah! ang is the winner of D-U-G-A #2! Just email me your info and I'll send off the goodies to you. Now for the 3rd giveaway. All the items are good for dress-up. There is a twist. You have to make something with some (or all) of the items that you receive for your child or for a child you know. Surprise them with an imaginative dress-up gift. A cape? A bag? A skirt? A belt? I won't put a time limit on this because I know how busy we all are. When you've completed your dress-up outfit, post a picture on your blog for all to see. I'll make a Dress-Up List on my sidebar to let others know what you're up to. That's it! Leave a comment if you're interested. I'll pick randomly from the comments and post the winner next Monday. And...I'll tell you about the final Dress-Up Giveaway with a Twist #4.
in the eyes of a child. Making a quilt has been on my mental to-do list for quite some time. About 12 years ago, I started one then gave up and gave away the work-in-progress. It all seemed too time-consuming then. It's still time-consuming (I think...maybe a bit?) , and I am busy, but I'd like to try my hand at it sometime soon. My bed really needs a quilt of some sort. The more modern quirky ones appeal to me more than the traditional ones. I love the ones that Erin has made and is making. And of course there's Denyse's quilts, which I admire. 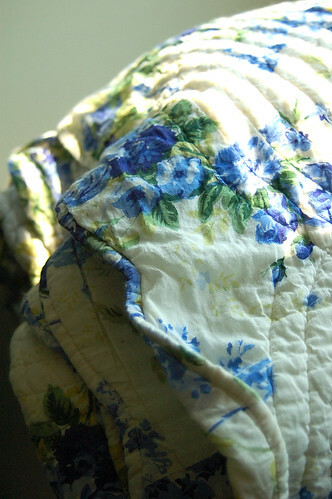 There are a ton of blogs out there with quilts galore. Some very crafty and talented people: too many to mention here. Did you know that you could possibly win this quilt? Go and see...Old Red Barn is either crazy or extremely generous! A little goodness arrived a few days ago. I have to say that these freshly squeezed fabrics are just the thing. I think they're might be a color theme going on? Isn't she lovely? From Elsita. and a set of napkins & placemats. My BTRSswap partner sent me these. You can see the matching napkins & placemats here. You can see lots more sets here. Dress-Up Giveaway Logo, originally uploaded by pichurrayic. Mirre from Kisskus is the winner for D-U-G-A #1! Just email me with your info, and I'll send off your goodies. Now onto the 2nd giveaway. For those of you just visiting, I was decluttering (finally) and found some items good for dress-up. I'd like to give them away to you (a. because it's fun and b. because I need to simplify!). There is a twist, however...you have to make something with some (or all) of the items that you receive for your child or for a child you know. Surprise them with an imaginative dress-up gift. A cape? A bag? A skirt? A belt? I won't put a time limit on this because I know how busy we all are. When you've completed your dress-up outfit, post a picture on your blog for all to see. I'll make a Dress-Up List on my sidebar to let others know what you're up to. That's it! Again, leave a comment if you're interested. I'll pick a name randomly and post the winner next Monday. And... tell you about Dress-Up Giveaway with a Twist #3! Yes, that is a basket! It's for their Biblical costume night. went out for ice cream. We said our goodbyes today and watched them board the bus. He looks more pensive than sad..."Will I be old enough next year?" My youngest is of course, sad to see them go. That is, until I promised (bribed?) him with a trip to the aquarium. At which point, he perked right up with a big grin on his face. So it'll be just him and me (and my husband). Feels sort of strange actually, but I think all of us will enjoy our time together sans siblings. We've got some more preparing to do: errands, cleaning, planning for school, visits with friends, swimming and maybe some Indian food? hopefully finish some sewing? We'll see. My daughter finished her first skirt - mainly by herself. She wishes it were longer and a little less 'poofy'. Next time she says she'll pick a skirt without all those gathers. I think she did a very nice job. Will she catch the sewing bug? My daughter and I experimented with dark & light during the 4th of July. We put together a group of photographs with an other-worldly feel to them. In some of them I can imagine sea creatures or black holes. Many remind me of Dale Chihuly's beautiful glass art. Take a look. What do you imagine? I'm pretty happy with this one even though I had to make a few alterations (again). It's a learning process...learning process... learning process. I have to chant that every now and again to keep from giving up. I chose the sleeveless version so that I can wear it over a t-shirt. I added some side slits. Before sewing, I added more width to it but then had to remove some of the width (after the shirt was put together mind you). I realize that my shoulders are a littler narrower than my stomach & hip area. So I need to keep that in mind for next time. This looks more true-to-color than the top photo. I really love the fabric. It's an inexpensive cotton from a local fabric store (nothing fancy) but the pattern is very Japanese-esque. Although it's printed, it reminds me of the traditional ikat cloth called kasuri. Yes, some insects are loving our green beans. Actually the beans are doing very well, but I have noticed some other plants that might need a little helpful intervention earlier than later. A few beautiful but deadly spotted and striped beetles have been caught creeping across the leaves of our eggplant and cucumbers. It's only a matter of time before I see more of them. Any ideas? I'm thinking of floating row covers or some organic spray. Not sure. But our tomatoes are growing! We have 11 tomato plants. None are ready yet, but there's promise in the air. My youngest keeps referring to them as little green potatoes. I keep these separated because some of my children don't like tomatoes. This won't last too long! & (my favorite) Chopped Kale Salad. It's from the CSA we used to belong to. (I miss it!) I tweaked a few things to pump up the flavor a bit. What's great about this is that it lasts in the fridge for many days. (Not sure how long that is since it gets eaten quickly...) The first day it's crunchier; the consecutive days tastes better; the kale seems to soak up more of the dressing. Enjoy! My youngest says the dress-up box is 'drooling'. We have a white toy box which has been dubbed the 'Dress-Up Box' and from which many phantasmic and eccentric outfits have been created. Maidens, cowboys, knights, mermaids, lords, ladies and vikings have appeared from the box. Many battles fought, many monsters scared away, many tea parties enjoyed. My children have loved dressing up and acting out elaborate stories, often spending hours at a time pretending. Although 2 of them (sadly) no longer take part in the phenomena (except on occasion), 2 of them (my younger boys) continue to role play and in full garb! Sometimes the best outfit is simply a piece of fake fur or an old scarf. Over the years we've filled the box with homemade items and thrift-store items, hand-me down items and shiny new things. Last week I mentioned that I would begin a month-long round of Giveaways with a Twist. 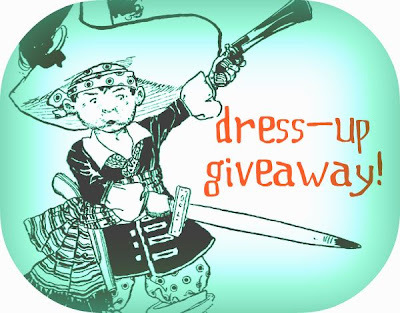 So... Each Monday in July, I will try to post one Dress-Up Giveaway. From my craft piles, I've found some things that I no longer need. I've divided them into 4 different groupings. Each grouping has items that would be good to use for making a dress-up outfit: fabric, trim, tulle, thread, etc. I would like to give you a group of fun things to use and enjoy. You have to make something with some (or all) of the items for your child(ren) or for child(ren) you know. Surprise them with an imaginative dress-up gift. A cape? A bag? A skirt? A belt? I won't put a time limit on this because I know how busy we all are. Then when you've completed your dress-up outfit, post a picture on your blog for all to see. I'll make a Dress-Up List on my sidebar to let others know what you're up to. That's it! If you're willing to participate, go ahead... leave a comment...good until this Friday. I'll pick randomly from the comments and post the winner next Monday. I'll also announce Dress-Up Giveaway with a Twist #2. Stay tuned!